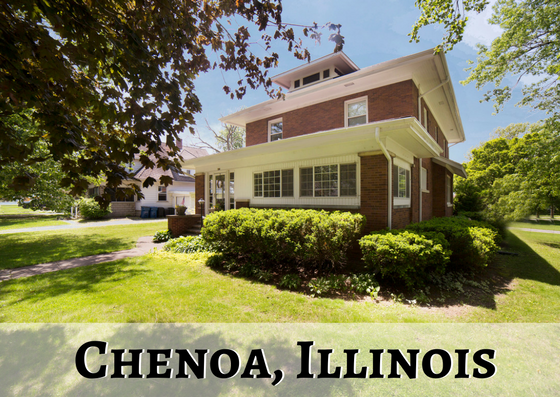 If you’re looking for the epitome of rural living in Central Illinois, look no further than the City of Chenoa! Pick any one of the beautiful days left this summer, grab your family, jump in the car and head north on Historic Route 66 until you reach U.S. Route 24. Chenoa is located about 110 miles southwest of Chicago and 190 miles northeast of St. Louis, making it a great place to settle if you have roots in either one of the two major cities but the desire to live in a small town. The population is approximately 1,800 people and if you ask any one of them, they will rave about the abundance of country dining, local shopping and community events. The education in Chenoa includes: HIS Kids Preschool, Chenoa Elementary, Prairie Central Upper Elementary, Prairie Central Junior High, and Prairie Central High School. There is no shortage of fun to be had in Chenoa! The Chenoa Swimming Pool is always a hot spot during the spring and summer months and is open 7 days a week from Memorial Day through Labor Day. There is also the Silliman Lake Park that features a boat dock, year round fishing and picnic pavilions. If you’d rather spend your days on dry land, members of the community can visit Main City Park, Kelleher Park, or Red Bird Park to play sports or enjoy the playgrounds. We highly recommend checking out some of the community events in town and in particular the annual 4th of July Celebration. There is a parade, flea market, food and fireworks that always draw a crowd and are talked about for months. Now that we’ve shared some of the reasons to visit Chenoa, let’s talk about living there! The real estate market includes land for sale and multiple existing homes looking for new owners. Whether you’re looking for a quaint ranch style home under 1,000 square feet or a beautiful 2-story farmhouse with some more room, our team is excited to find exactly what fits your needs. The character found in most of these homes can only be appreciated by walking through the front door and seeing it for yourself. No matter what the size of your budget is, the value found in these homes is second to none. One thing that we know for sure is that if you like the idea of living in a rural community, you need to let us show you around Chenoa and you absolutely will be surprised at just how far your dollar can stretch.